What a difference a year makes. 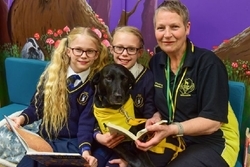 A lovely article about Annie the Labrador who has gone from being found abandoned on the streets to helping school children develop their reading skills through Paws & Read. Read her story here. Recently there has been much press coverage and enthusiasm suggesting schools get their own Therapy Dog as emotional support for the students. The BBC, the Education Secretary and even our own enquiry line has been buzzing since our successful stint as part of the Kennel Club’s Bark & Read programme at Crufts. The benefits of dogs in schools has long since been recognised, helping students develop communication skills and build confidence through reading programmes as well as providing emotional support and stress busting at exam time. Indeed, many of our enquiries are from schools wishing to get their own Therapy Dog or, from teachers, TA’s or staff wishing to get their own dog assessed so that they can take it into school with them. This is fantastic, it is great that more & more children are going to have access to this unique and effective service but often the basic needs of the dog are often over looked. This article explains why we support the external visitor model and highlights some key points that need to be considered. It is important that any dog is part of a formal programme and has completed regular, comprehensive temperament assessments. This is something that needs to be checked to ensure that proper measures are in place for the safety and well-being of the dog and the children. 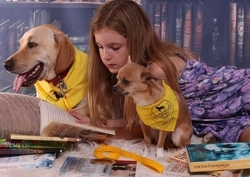 At TDN we are proud to be members of The Bark & Read Programme which is based on an external volunteer model and we will only accept school staff members as volunteers when they can do it in their own free time, when they do not have any teaching or supervisory responsibilities. The dog needs to be handled at all times by their owner or by another household member who knows the dog extremely well. Our visiting dog are family pets, trained to Kennel Club Good Citizens Silver level equivalent (or higher), who go on to pass a stringent behavioural assessment every two years with a qualified assessor and then come to school with their owner on a visiting basis, (it is worth noting that a Gold Standard dog does not automatically qualify them for the role of visiting Therapy Dog, a behavioural assessment also needs to be passed). The dog may have several roles within the school. They could accompany reluctant readers, giving encouragement and comfort and providing the reader with a safe audience to practice on without feeling self-conscious, or, provide emotional support to students on a either a regular basis or at times of increased stress or anxiety such as exams or a traumatic event. The dog owner is there solely for the dog’s benefit and we favour this approach because the handler has one responsibility only and that is to give their full attention to looking after and monitoring the dog. In terms of liability and insurance, this works best because the school is not responsible for the dog at all – the management of the dog lies wholly with the owner. For instance, if the dog needs to be withdrawn from the classroom in the event of an emergency, such as a fire alarm, or a volatile situation, such a student who is injured or very upset which may trigger an adverse behaviour reaction in the dog, the teacher or school staff member is not put in the position of choosing whether to respond to the student’s needs or to the dog’s needs, especially if it means leaving the room and potentially leaving children unattended. For the dogs, their working hours need to be quite limited to avoid stress and tiredness, so when it is a staff member’s own dog, questions arise regarding what happens when the dog is not working but is still in the building – is there provision for food, water, toileting, walks and rest time away from students and other staff? Also, long-term, what happens if the programme has to be halted suddenly, due to a student or staff member who has serious allergies or fear of dogs – if a teacher or staff member is used to being able to bring the dog in regularly, other arrangements for the care of the dog during the day will have to be made. To date, there has only been limited research into the effect of this type of work on the dogs themselves, but what we have so far suggests that this is definitely “work” for the dogs, even if they seem to be in passive or play mode and they do find it tiring. It is not like being at home in their own place with their own family. Additionally, our volunteers are covered by a low-cost public liability group insurance policy taken out by the charity (or service provider with which they volunteer). Teachers and staff members using dogs in the context of their paid employment can’t avail of these kinds of policies and must take out a full-price policy at their own expense. Insurance is often overlooked with many schools believing that the dog is covered either by standard pet insurance or by their own school insurance. This is rarely the case as a specific “School Dog” will often be classed as a working dog and additional cover will need to be purchased. It is our strong advice that you do not consider using a staff-owned dog in the classroom, but avail of an external volunteer programme instead. If you would like more information you can visit our “schools” pages or download a Schools Information Pack here. To arrange a visit, please use the “contact us” button. 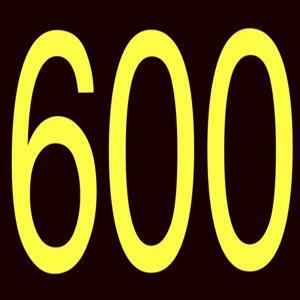 Today our fantastic admin team registered our 600th volunteer! Hip Hip Hooray! Welcome to our new website, we hope you like it as much as we do!